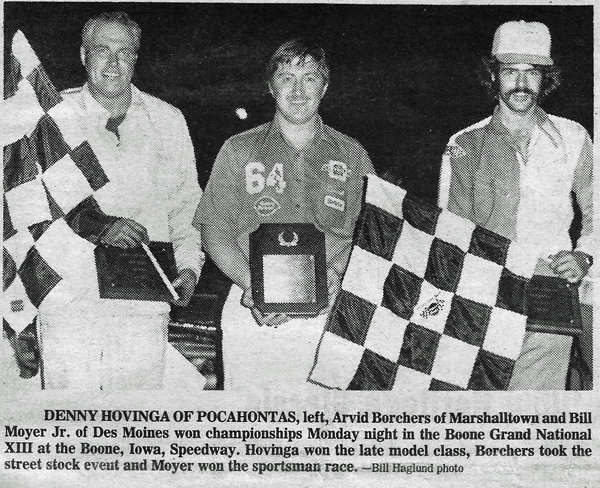 Boone, Iowa (July 30, 1979) – Denny Hovinga from Pocahontas, Iowa, a man who knows Boone Speedway as well as anyone and better than most, led from start to finish Monday night to win the Boone Grand Nationals XIII on the high-banked, quarter-mile dirt oval. Hovinga, co-holder of the qualifying record of 17.13 seconds along with Don Hoffman of Des Moines, ran laps consistently below the one-lap record in winning his second Grand Nationals title. His first Nationals win came in 1971. He joined Ed Sanger of Waterloo, Iowa, as the only two-time winners of the event, George Barton of Ankeny, Iowa, is a three-time winner. Qualifying heats and position races for Monday’s 50-lap main event were held one week prior to the running of the event. The features had been scheduled for Tuesday, July 24, but heavy rains forced moving the show back one whole week. Because of the delay, several drivers who had been at Boone on opening night were unable to return for the main event the next week. Included were drivers from Missouri, Nebraska and some farther corners of Iowa. However, the week’s delay did give some drivers an opportunity to attend this week who couldn’t last week. 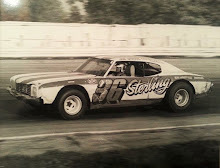 Included was defending champion Ed Sanger, along with several other drivers returning from a five-race series in North and South Dakota. 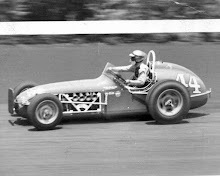 Because Sanger was the defending champion, he wasn’t required to qualify to earn a starting spot in the feature grid. 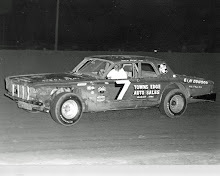 He ran the four-car semi-main, but played it safe and ran at the back of the pack. 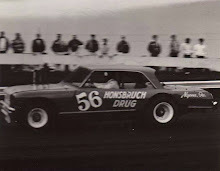 Still, that placed him the last starting spot for the 50-lapper. Once the green dropped, however, Sanger didn’t remain in back for too long. His charge through the field netted him a third-place finish behind Hovinga and runner-up Tom Bartholomew of Waterloo, Iowa. Bartholomew gave the fans in the nearly-packed grandstand several moments to cheer late in the race as he made repeated challenges to Hovinga, at one time almost drawing side-by-side with the eventual winner. However, with Hovinga running the low side of the track and Bartholomew challenging on the high-side of the track, the gap soon widened again and Hovinga took the checkered several lengths ahead. The 25-lap sportsman feature was an all-out run for the checkers with Billy Moyer Jr. of Des Moines taking home the top prize. Des Moines’ Rocky Hodges grabbed the lead from the start with Ken Davidson of Indianola, Iowa, and Moyer tucked in behind him. Soon, however, Moyer got around Davidson and began working on Hodges. 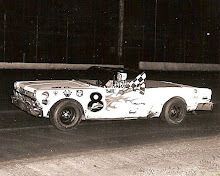 Midway in the race, Moyer slipped past Hodges for the lead and then held off a determined Steve Shannon of Norwalk, Iowa, for the win. Arvid Borchers of Marshalltown, Iowa, won the 15-lap street stock title, leading start to finish.